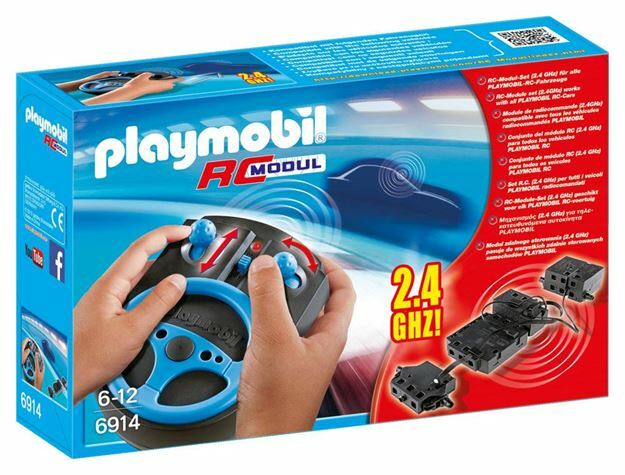 The Playmobil RC Module Plus Set is for upgrading all RC Compatible vehicles. The unit has three speed settings and gives the vehicle steering capabilities. Includes: a handheld controller with forward/backward and directional controls and sections that fit underneath the vehicle to power the wheels. The red LED flashes consistently when new batteries are required. After every battery change the transmitter and receiver will need to be paired together again. Requires 1 x 9V and 4 x AA batteries (not included). Age 6+ years. Distributed in New Zealand by Holdson. Copyright © 2019 Holdson. All rights reserved.